Preheat oven to 350 degree Fahrenheit. Line two muffin tins with cupcake liners. Place the flour, sugar, dark brown sugar, baking soda, baking powder, salt, and pumpkin spice into a large bowl. Gently stir to combine. Add in the oil and pumpkin, and stir until incorporated. Mix in the eggs, one at a time. Add in the espresso mixture, and stir just until the batter in smooth. Another option is to swirl this batter with my favorite vanilla cupcake recipe! I decided to combine the two batters, to give these cupcakes a more exciting look. I alternated scoops of each batter, then used a knife to create a swirled pattern. This doubles the yield of the recipe. Fill cupcake liners 3/4 full, and bake for 18 minutes. Remove from oven and place on wire racks to cool. To speed up the cooling process, you can also place the cupcakes in the freezer for 15 minutes. 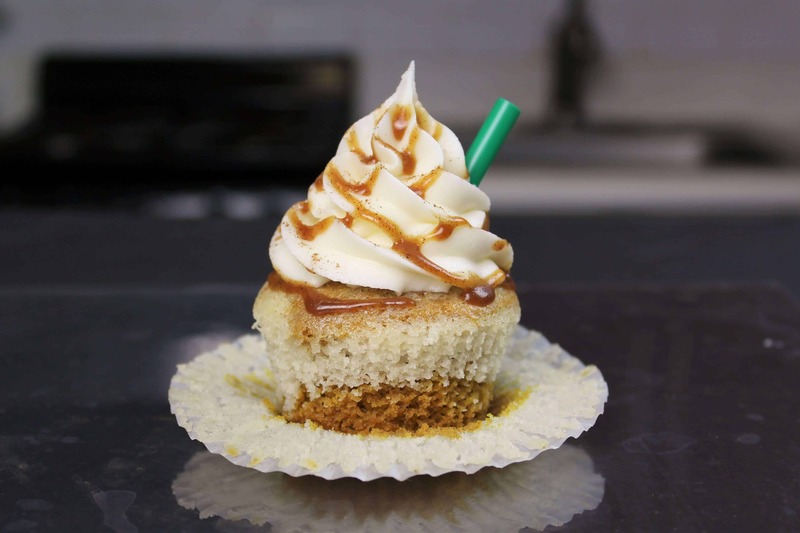 While the cupcakes bake, prepare the pumpkin spice caramel. Turn stove onto medium heat, and place a pot over element. Pour in ¼ of the sugar. Using a heat proof stirring utensil, stir until sugar begins to melt into a clear liquid. Gradually add in the remaining sugar, in a few installments. Continue to stir, until the sugar is fully liquefied, and has become an amber. Keep stirring until all the clump of sugar have dissolved, and then turn off the heat. Mix in butter slowly, then stir in cream, salt, and pumpkin spice. Place in fridge to cool for 20 minutes, then pour into desired container. I put mine in a squirt bottle (for drizzling over cakes), but a mason jar or Tupperware container would work great too! The caramel will keep for several weeks in the fridge. You can see a full tutorial on how to make this caramel here. Next, prepare the cream cheese frosting. Beat the butter and cream cheese on a medium speed for 30 seconds, until smooth. Slowly add in the powdered sugar, 1 cup at a time. Alternate with small splashes of cream. Once fully mixed, add in the vanilla and salt, and beat on medium low until the ingredients are fully incorporated, and the desired consistency is reached. If the frosting is too thick, add in cream (1 teaspoon at a time). If the frosting is too thin, add in more powdered sugar (quarter of a cup at a time). To watch a full tutorial on how I make my frosting, you can click here. Once the cupcakes are fully cooled, frost them with a Wilton 1M (open star) tip. 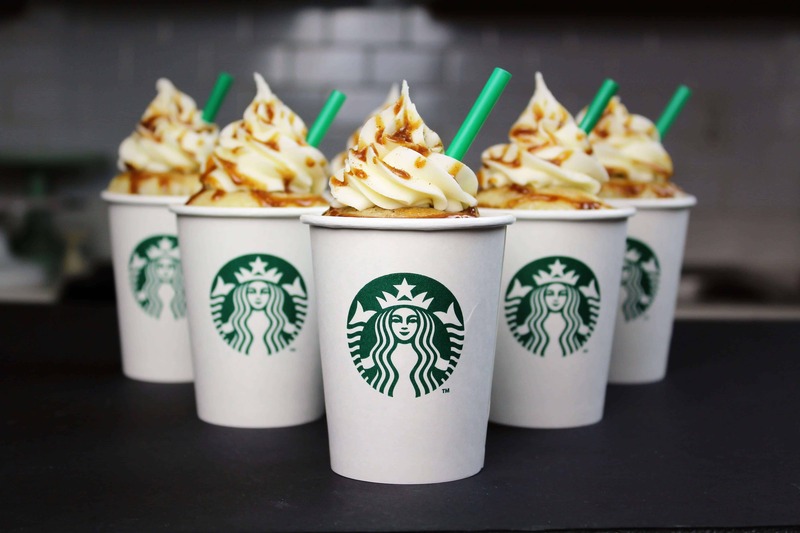 Drizzle with Pumpkin Spice Caramel. 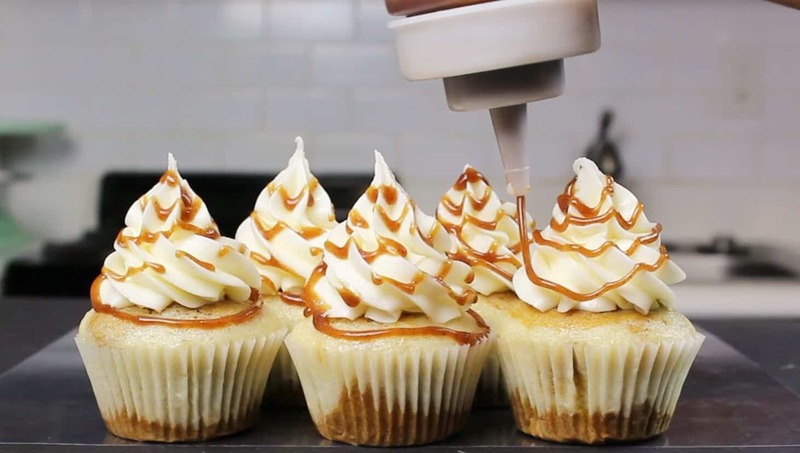 Be sure the caramel is fully cooled, or else it will melt the frosting! Lightly dust the cupcakes with pumpkin spice. 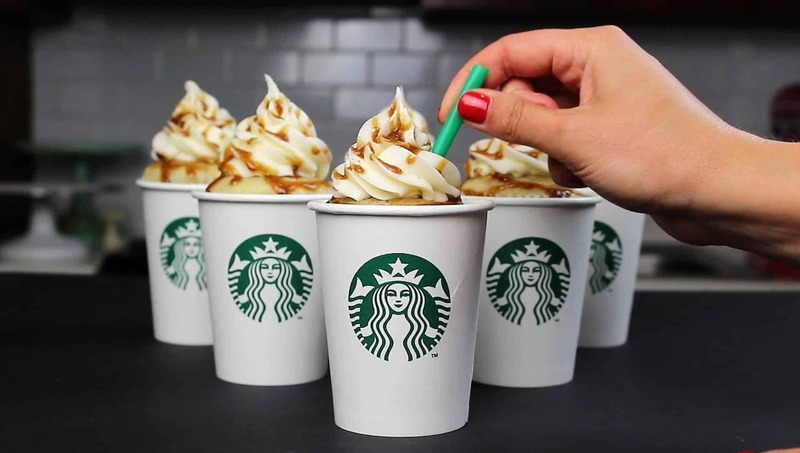 To take the decoration of these one step further, you can place them into the short cups from Starbucks (I filled the base with pumpkin candies, to make sure the cupcakes were elevated enough, and add a trimmed green straw! By swirling the batters together, you get the below look! I love fall and all things pumpkin! I can’t wait for it to cool down enough here for sweaters to be exceptable and leaves to begin changing. Sadly I don’t! I should work on that!! !